Wednesday roundtable: What does the Pac-12 tourney mean for Stanford? The 2015 Pac-12 Men’s Basketball Tournament kicks off on Wednesday with the first-round games. With Stanford facing off against Washington at 8:30 p.m. after a 91-69 loss to Arizona to end the regular season, we asked basketball writers Jack Seaton, Irving Rodriguez and Nic Radoff: What does this tournament mean for Stanford? What does the team need to do to have success in the postseason? Jack: It was always going to be tough to feel satisfied with this season following the loss to Oregon that all but solidified the team’s exclusion from the NCAA tournament. There is obviously still a chance that this team can win the Pac-12 tournament and clinch a spot in the national tournament, but with the team’s recent form being poor, morale being low and the recent injury to Michael Humphrey taking away some of the team’s depth, it looks unlikely that the Cardinal will manage much more than a strong push without a drastic change of heart. At this point, the Pac-12 tournament and the NIT seem like consolation, but they are the last opportunities to salvage some hope for the fans and the team. The end of the season has seemingly fizzled out. There has been no last explosion of celebration, nor has Stanford been able to dream of the seemingly impossible. These past three losses have culminated in a distinctly empty feeling in the belly of the Stanford community. While it is easy to sigh, shrug and give it a clichéd “we’ll get them next year,” these last few weeks of the season could prove to be instrumental in building for next year. The Card say goodbye to some seniors who have entertained the many of Maples for years. These tournaments are the last chance for these players to leave their mark and will undoubtedly maintain a high level of intensity to do just that. Chasson Randle, Stefan Nastic and Anthony Brown have had illustrious careers with Stanford, and these coming weeks offer an opportunity for them to go out with their heads held high. Flashing back to the last home game of the season against Oregon, one of the highlights of such a tough loss was the crowd. Maples was full. It was loud. It was a home court. If this season ends with some positive results and some games for the Stanford fans to cheer about, then the volume in Maples might be turned up next year. Creating a strong home court advantage would be a season-changing development for next year. If this program wants to develop, Stanford must radiate the sense that this is a school where basketball is a strength. The team has to perform from this point on for the sheer purpose of maintaining a foundation for next year’s fan base. Going into the Pac-12 tournament, the team needs to evaluate the opportunity presented to it and refocus its motivations. If it can do this and create a mindset and a need to win, then it has a chance to win this tournament and salvage something incredible from this season. 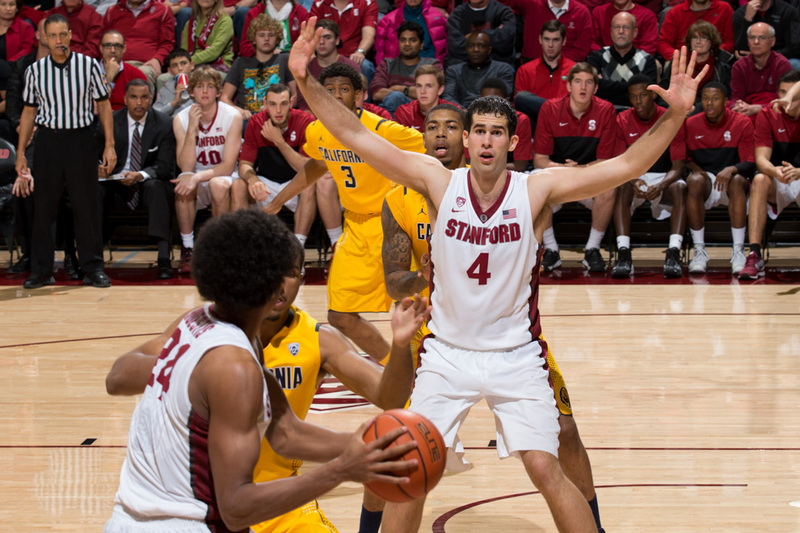 There isn’t a team in the conference that Stanford did not at least give a strong fight. On its day, this Stanford team is capable of beating any squad. They have the talent to win it all, but they just have to build the mental strength to work for it. Irving: The Cardinal should look at this Pac-12 tourney as an opportunity to mesmerize offensively once again and rise above their shortcomings in the last stretch of the regular season. Stanford’s offense took a complete 180 between January and February. The Cardinal were an efficient and versatile machine in the first month of 2015, scorching opponents for 76.8 points per game and posting an effective field goal percentage of 54.3 percent. In February, those figures dipped dramatically: Stanford only scored 69.8 points per game and held an atrocious eFG clip of .459. I believe the team lost a bit of faith in its sets as games became tighter and more competitive. Fortunately, the system that made us see Stanford as a guaranteed NCAA team is still in place. Come tipoff against Washington, the team will have had four days to step back and forget the three consecutive losses at the end of the season. The (somewhat) good news for Stanford is that it drew into Utah’s side of the bracket. The Utes are the biggest obstacle to the Pac-12 final and they’ve looked relatively vulnerable when compared to Arizona. Oregon did a good job of exposing Utah’s weak-side defense in a 69-58 home win, and Utah had its eyes on the postseason as it went through the motions in a loss to Washington in its last game. If the Cardinal get past Washington in the opening round, they have a legitimate chance for an upset. Of course, that depends on which Stanford team shows up to this tournament. Utah is still, by far, the second-best team in the conference. Oregon’s eccentric hot streak has closed that gap some, but the Utes are clearly the team to beat behind Arizona. That bodes well for the Cardinal, who might earn a play-in game in the NCAA tournament if they overcome Utah and Oregon en route to the Pac-12 final. Stanford will have to hope that those wins bolster its resume enough because I don’t think anyone is beating Arizona until the Elite Eight of March Madness. In short, this tournament means a lot. The narrative on what was once a promising season for Stanford basketball has dimmed out significantly in the last month, but it by no means has a tangible conclusion just yet. The Cardinal can show how good they still are, and they can do that by playing like the Stanford of January in this Pac-12 tournament. Nic: It ain’t over ’til it’s over. That being said, it’s a tough road ahead for the Cardinal, including a rematch against the team that handed them that 91-69 loss at the end of the season. It could certainly be said that Stanford was considerably deflated by its road loss to ASU the game before, but there was still a shot at an at-large bid, albeit extremely small, if it had managed to knock off a likely number-one tourney seed in Arizona. Stanford certainly didn’t play like there was still a chance and looked languid and uninspired in its last regular-season game. But one of the great things about sports, or indeed any competition, whether it be against another team or just yourself, is that some of its core aspects are pride and honor. The Cardinal will need that and grit to make a deep conference tournament run. For those of you unfamiliar with tournament qualification, the winner of the Pac-12 Tournament (or any conference tournament) gets an automatic bid to the NCAA rendition. I still think that there is a minute chance that Stanford might sneak in. If it makes it to the Pac-12 final, beating Arizona in the process, and all other teams that were already going to the NCAA Tournament win all their conference tournaments, the Cardinal might get a look. Maybe. Even then, it’s very doubtful. Fine, fine, not really, but I’m an eternal optimist. The way the Cardinal played against ASU was disappointing. Sure, ASU has an impeccable record at home the last few years, but that was a game that Stanford should have and needed to win. That loss seemed to take all the air out of Stanford’s sails and those sails were thoroughly shredded by Arizona. For Stanford, this tournament is all about resilience and belief. Just like in the Big Dance, any team can get hot and win it all. Just ask defending champions UConn. Kentucky will be overwhelming favorites, but when one game decides it all, as any statistician will tell you, the outliers matter a whole lot more. The same goes for the Pac-12. Arizona will be the clear favorites, but anyone can make a run with a shot at getting a tournament bid. That being said, these last games are all about pride. Stanford needs to show that it was worthy of the preseason hype and expectations, that it was an unlucky team and not a letdown. Should Stanford get knocked from the conference tournament, it will almost certainly land in the NIT. Stanford really should have a strong showing there, especially given the fact that it was projected as a NCAA Tournament team for almost the entire year. The Cardinal were really hurt by injuries and their first half of the season brilliance suffered as a result. The team looked like it was on the cusp of coming together only to struggle down the line, even when some key youngsters stepped up. I think part of that was that they sensed the pressure was on and the team’s best players were trying too hard to do too much. It’s always harder to meet high expectations than exceed low ones, even if the end result is the same. The pressure is on for the Cardinal now, though, who are at risk of a quick bow out from both the Pac-12 Tournament and the NIT. If they’re really the team that most people thought they were, then we’ll get to see a healthy dose of the emerging stars. I’d really like to see Reid Travis dominate like he has at his best, Mike Humphrey continue to grow and the young guards to step up. But mostly, I’d like to see this team dig deep, play with the pride they are deserving of and hard for the name on the front of their jersey. Contact Jack Seaton at jrseaton ‘at’ stanford.edu, Irving Rodriguez at irodriguez ‘at’ stanford.edu and Nic Radoff at nradoff ‘at’ stanford.edu.